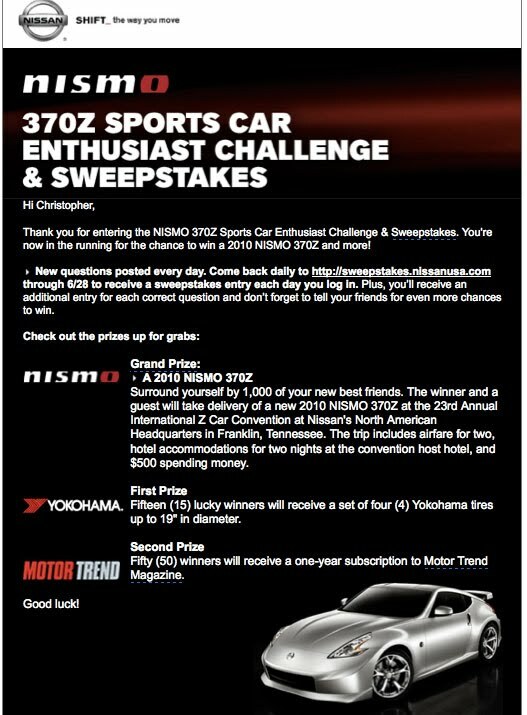 Nissan is appealing to their enthusiast target customer in its latest contest. The NISMO 370Z Sports Car Enthusiast Challenge & Sweepstakes does this in a fun and unique way by having contestants take a quiz for an opportunity to get more entries to win a 2010 Nissan 370Z NISMO sports car. The contest goes through June 28, 2010 and to date has 44,388 contestants having played the game since early April. Participants get entries to win by correctly answer questions of a per day 3 question quiz, by simply returning to the site and entering their email, and can also gain more entries by sharing the site with up to 3 of their friends for up to 3 additional entries. The share with your friends to get more entries to win is the first time I've seen an automaker incentivise contest sharing by giving a reason for people to share: more entries to win. I've never really understood sharing a contest site with others because doesn't more participants equal a worse chance to win? Here Nissan battles that issue by giving a bonus entries to the person doing the share. 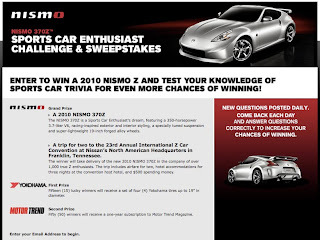 Quiz questions are very effective here as the questions build more knowledge about the Nissan 370Z NISMO. It's a great way to increase interest in the vehicle to an enthusiast culture who cares about the detailed specifications of the sports car. The site also links out to the Nissan site where contestants can choose from a variety of exit paths specific to where they are in their own shopping or interest path.